1. On the homescreen, click on the menu. 3. Select the ‘My Recipes’ tab. 4. Click the ‘+ Create a recipe’ button. 7. Choose a category for your recipe by clicking the ‘category’ button above the recipe photo. 8. Click on ‘+ Add Ingredients’ to search and add ingredients. 9. Search for a food by entering a keyword into the search bar. 10. Select the orange plus button to select that ingredient and specify the quantity of the ingredient used in your recipe. 11. Click on the flame icon to the right of the ingredient quantity to set the cooking method for that ingredient. Cooking methods should be applied to all recipe ingredients to account for nutrient changes during the cooking process. This should only be applied if your ingredients are entered as raw (or applied to cooked ingredient where they have a second cooking method or process. 12. Click the tick icon once you have selected your ingredient quantity and cooking method. 13. Repeat steps 9-12 for each ingredient and click ‘back to recipe’ once you have added all ingredients. 14. Enter the number of portions this recipe serves. 15. You can select properties for your recipe, for example, if it’s vegetarian or gluten free. 16. 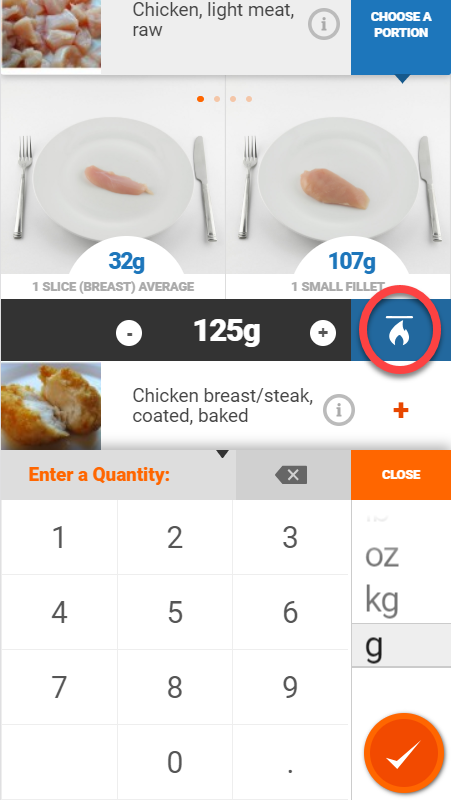 Add any cooking instructions and notes for your recipe in the free text box. 17. Review the allergen information to ensure it is correct. 18. Add properties to your recipe as appropriate e.g. vegetarian or gluten free by clicking on the properties icon. 19. Select on the orange tick to save your recipe .